The late LA artist Mike Kelley was long preoccupied with Superman comics, specifically the mythical city Kandor, capital of the planet Krypton. Now, if you go to Hauser & Wirth Gallery in downtown LA’s Arts District you can find “Mike Kelley Kandors 1999 – 2011.” The show is made up of architectural renderings, drawings, sculptures, installation videos and set pieces, all tied to Kandor. “The story is that Brainiac, an evil villain, was running around the universe, stealing cities, shrinking them, storing them in bottles and then taking them to his lair. And Superman goes and rescues his own hometown,” said Mary Clare Stevens, the show’s curator and Kelley’s longtime studio manager. She explains the project fits within Kelley’s other interests: alienation, historic depictions of the future, the nature of memory and nostalgia, and how we project onto self-created narratives. You begin your visit in a room with a large banner that says ‘Welcome to KandorCon 2000,’ part of an imagined convention of Kandor enthusiasts. But just as you feel it’s getting a little obscure, you walk into a dark room that is filled with 21 large glass bell jars, each on its own stand, each filled with its own little imaginary city made of colored resin. The jars are made of tinted glass and the whole effect is quite beautiful. “It almost looks more like some kind of modernist sculpture versus a city. It's a very radical interpretation of a city. So there's this openness about what architecture is, what a city is,” Stevens said. Drohojowska-Philp explains the fascination held by Kelley – and fellow LA artist Catherine Opie, also a guest on this DnA – for utopian architecture and cities. Both Los Angeles itself and its 20th century buildings, as well as movie depictions of the future were a source of inspiration. The Hauser & Wirth show closes this weekend with a series of experimental music performances inspired my Kelley’s own musical forays, including with the Detroit proto-punk band he founded, Destroy All Monsters. 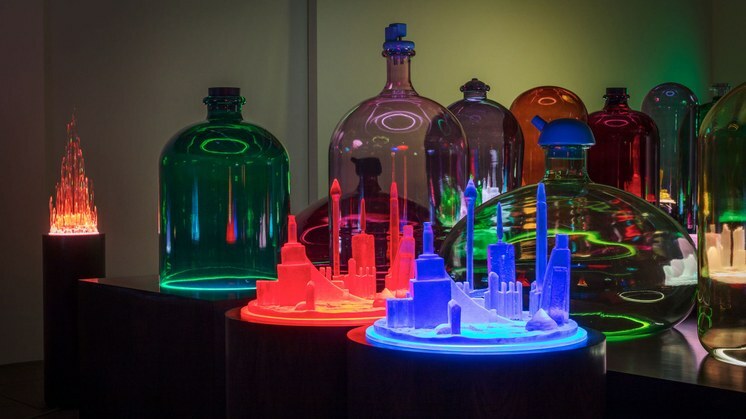 The late LA artist Mike Kelley was long preoccupied with Superman comics, specifically the mythical city Kandor, capital of the planet Krypton.